An Austin clothing boutique drew dozens of shoppers Saturday for the latest economic empowerment rally in support of local black-business owners. 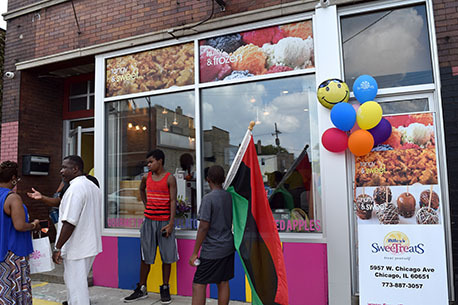 Second Time The Charm Boutique, 5303 w. Chicago Ave., hosted Saturday’s Black Economic Empowerment Rally (BEER). Owners Shiwanda and Ezekielus Starr opened their clothing and accessory store in January 2014. The boutique is the fourth West Side business, and third in Austin, to host the BEER event sponsored by Austin African American Business Networking Association. Nearly $1,000 was spent in roughly two hours at the Feb. 28 event. The shop caters to women, offering clothing, jewelry, shoes, hats and handbags. The boutique was Shiwanda Starr’s dream and vision, said her husband, who works in education. She participated in Bethel New Life’s entrepreneurship program, which offers training and start-up grant money to help business owners. The Starrs are also AAABNA members, but BEER events are open to any black-owned business, says Malcolm Crawford, the group’s executive director who operates Sankofa Cultural Arts & Business Center. Saturday’s BEER drew regular customers like Cierra Barnes and Arielle Little as well as new shoppers. Barnes bought a beaded baseball cap to match the one she was wearing. The store is an upscale resell boutique with affordable prices, said Starr. The store also sells clothing and accessories for men and children. “I wanted to help families and single moms who have a small income. Yes, I want to make money, but I’m not in business to rob anyone. We should be able to look nice without breaking our pockets,” she said. Before launching their business, the Starrs said they often donated their own clothes to people who needed them, especially after the economic downturn of the mid-2000s. Starr was a homemaker while her husband worked. The couple have three children, a son and a daughter, and an adopted cousin they took in after the mother died last year. Ezekielus Starr said his wife is the face of their business. Customers look for and ask about her even when she’s not in the store, he said. It was that kind of community commitment that attracted the boutique to AAABNA, Crawford said. Starr attended AAABNA’s last BEER event at Annie Bell Fragrances, 3 N. Austin Blvd., in October. The other BEER events were held at Surf’s Up Restaurant on Madison and a black-owned Subway at Pulaski and Lake. The network scouts out prospective businesses before selecting them. Since their first BEER event in May 2014, many business owners have contacted the networking association to host one at their places, Crawford said. AAABNA would like to host BEERs every other month, if not every month, but there’s a lot of work involved, Crawford said. The BEER events have been successful, drawing large crowds and dropping thousands of dollars in a short shopping span in cash registers. The next BEER event and location is still being considered, Crawford said. Those in attendance at this month's meeting of the Austin African American Business Network Association were encouraged to apply for a Retail Thrive Zone business development grant from the city of Chicago. More than $2,000 in sales was recorded Saturday at the Austin African American Business Networking Association's latest BEER event. The event will be held from 12 to 3 p.m. March 23 at Sankofa Cultural Arts Center, 5820 W. Chicago Ave.